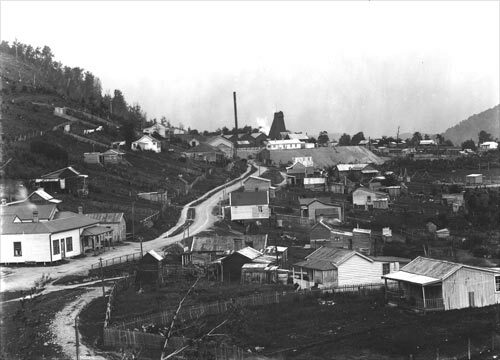 The town of Waiuta was typical of many mining settlements, with simple bungalows built of wood and corrugated iron. Mine buildings and the poppet head can be seen in the centre background. It was often said that the real gold mine was the hotel (bottom left). Although the houses appear stark and temporary, the town had been in existence for 25 years when this photograph was taken, about 1930. The road through the town has been metalled, and there are fences between the houses.